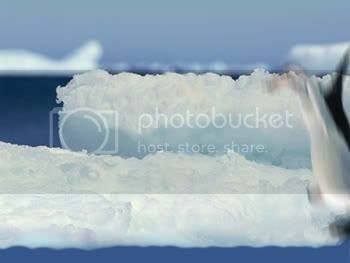 This tutorial covers the creation and use of motion blur in my "Penguin Playground" GIF animation. 1. For the first change in movement, I copied the shape of the penguin's left wing, filled it with the same black color as the penguin's back, and then flipped it horizontally. I also painted a simple black circle over the penguin's eye to give it an eyelid. To create the head of the penguin looking to the right, I copied the head from the external jumping penguin from step 3 and pasted it onto the body of the original penguin from the source picture. 2. 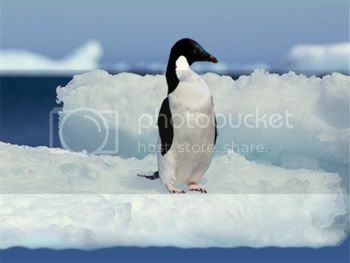 The next major change made was to copy the body of the penguin (minus the feet) and rotate it to the right. 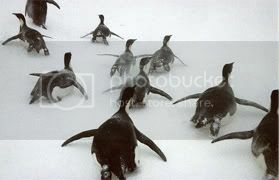 This serves to create a more realistic jump and also as a transition to the external penguin layer in the next frame. 3. External penguin added. 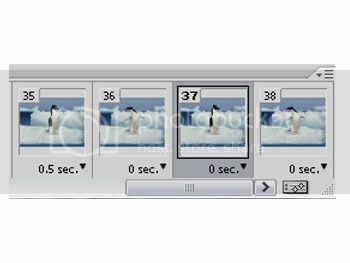 On the next frame, I moved the penguin slightly to the right and set the frame timing to 0.1 seconds to create the "hang time" of the highest part of the jump. 4. 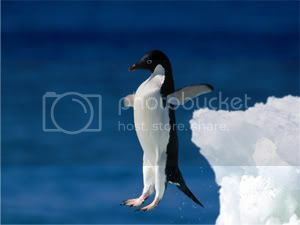 The next change is to copy the jumping penguin layer and apply motion blur. (Note - motion blur angle setting must match the angle of movement). 5. 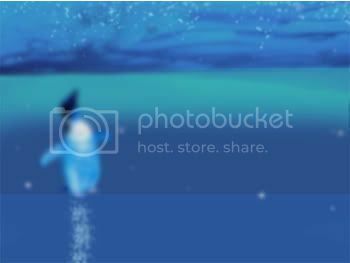 For the next series of frames, I had to create a full screen of an underwater scene using photoshop (no external used). The next step is to move the original background up so that only the lower half is visible in the frame. I then placed the top edge of the under water scene so that it touched the bottom edge of the original background. 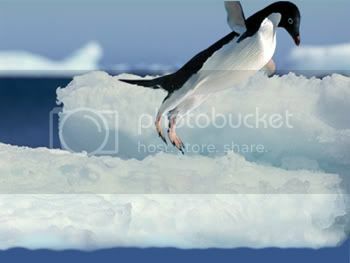 This is done so that, as the penguin dives down, the merged backgrounds can be moved up together. This saves a lot of work since the only other way to create this effect would be to make progressive partial copies of the backgrounds as layers. (Remember that, even though only the frame is visible, you can still have part of the layer extending outside of the frame) The same technique was applied to the bubble layers. To create the illusion of speed and movement, I copied the original background and applied vertical motion blur. The motion blur background is only visible for three frames but is a necessary touch of realism. 6. 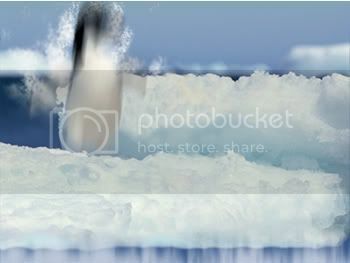 The external penguins under water were blended into the under water scene by playing with the color balance settings (image>adjustments>color balance) and using the blur tool. 7. 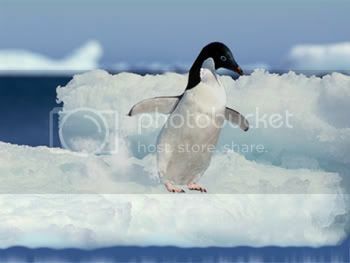 The penguin swimming up and jumping up out of the water is the reverse of the out-of-frame background movement trick that was covered in step 5. 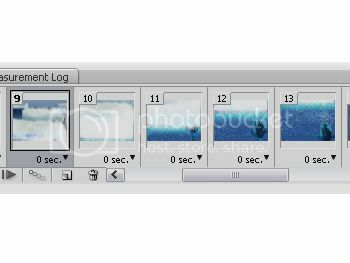 Once the penguin jumping out of the water, motion blur is applied to a copied layer of the penguin. 8. The penguin sliding to a stop is a recycled layer from step 2. 9. To create the head shaking movement, I just alternated between layers of the original source penguin and the penguin I created which looks to the right. Then I added some water drops flying from the penguin's head. I hope this is helpful and makes sense. If you have any other questions, or if I'm leaving some explanations out, feel free to ask. This is all very clear to me. I think it will be to others, too. The next question is how to get it into the tutes section. That gif you made there is simply fantastic! I wish I were able to make gifs like that. Also, it would be nice to have larger imagesizes at PSC for gif's, so you won't lose all that detail and colour. It'd be nice to see this in the tutorial-section. Somebody should make a version without the motion blur to illustrate how big of a difference it makes. Oh and Batman couldn't care less about spam. So there's a big "FAIL" for you forumreader.